O. aegyptiaca occurs in one location in California (Calflora). It is native to the Middle East and also occurs in Ukraine (DAISIE), Afghanistan, Pakistan and Iran (GBIF). O. aegyptiaca occurs in one location in California (Calflora). It is native to the Middle East and also occurs in Ukraine (DAISIE), Afghanistan, Pakistan and Iran (GBIF). It occurs in Afghanistan, Pakistan and Iran in locations which match the climate of California according to the Cal-IPC climate map. O. ramosa (and by inference O. aegyptiaca) can cause severe damage to important agricultural crops and prove very difficult to eradicate. All Orobanche are considered invasive where they occur, including their native range. O. ramosa (and by inference O. aegyptiaca) can cause severe damage to important agricultural crops and prove very difficult to eradicate. All Orobanche are considered invasive where they occur, including their native range. O. aegyptiaca occurs in Afghanistan, Pakistan and Iran in locations which match the climate of California according to the Cal-IPC climate map. 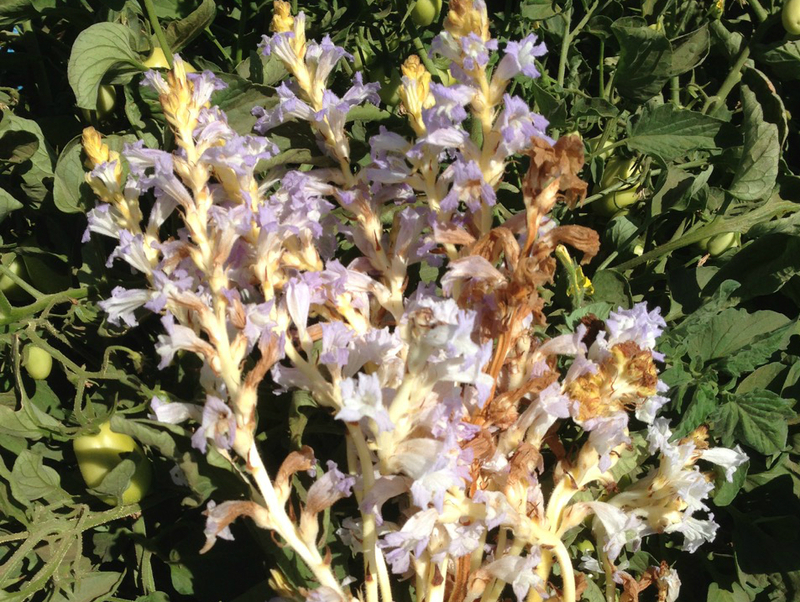 O. ramosa is also an invasive member of the Orobanche and causes economic damage to crops (CABI). O. ramosa occurs naturally in Mediterranean countries in southern Europe, Africa and the Middle East, extending eastwards to India, Pakistan and China, central Asia and southern Russia but has also been introduced to the USA, Cuba, Central America, Australia, West Africa, East Africa, South Africa and Chile (CABI). O. ramosa occurs in areas in South America, South Africa and Europe with climate which matches California (Cal-IPC). O. aegyptiaca occurs predominantly in areas which match the climate of California (GBIF and Cal-IPC). O. aegyptiaca is a crop parasite and so does not often occur in natural area or dominate native plant communities. There is no information on whether O. aegyptiaca promotes or changes fire regimes, but since it is a crop weed this is unlikely. There is no information on the toxicity of O. aegyptiaca, and the species is not noted as impacting grazing systems. O. aegyptica plants occur in agricultural fields and are attached to crop plants. They are up to 40 cm tall so would not block the movement of humans or animals. O. aegyptiaca reproduces by seed. A capsule [of O. ramosa and by inference O. aegyptiaca] develops up to 6-10 mm long and may contain several hundred seeds, each about 0.2 x 0.4 mm. A single plant carries ten to several hundred flowers and hence may produce up to a quarter million seeds. Rubiales, D., & Fernandez-Aparicio M. (2012). Innovations in parasitic weeds management in legume crops. A review. Agronomy for Sustainable Development. 32, 433–449. Visser, J. H. (1989). Germination Requirements of Some Root-Parasitic Flowering Plants. Naturwissenschaften. 76, 253–261. Jain, R., & Foy C.. L. (1992). Nutrient Effects of Parasitism and Germination of Egyptian Broomrape Orobanche-Aegyptiaca. Weed Technology. 6, 269–275. A capsule [of O. ramosa and by inference O. aegyptiaca] develops up to 6-10 mm long and may contain several hundred seeds, each about 0.2 x 0.4 mm. A single plant carries ten to several hundred flowers and hence may produce up to a quarter million seeds. Seeds germinate in the presence of host plants, otherwise they remain dormant in the soil until a suitable host is present. Seeds may remain viable in soil for many years, possibly 10 or more, and certainly for 5 years in many situations. Seeds are produced yearly in the presence of host plants. The very small seeds may very easily be moved from one field to another by water, wind, animals and man. The seeds remain viable after passing through the alimentary system of animals; therefore manure may be contaminated with viable Orobanche seeds. Agricultural products of various crops may carry Orobanche seeds if harvested in an infested field (CABI). The biology and distribution of O aegyptiaca is similar to that of O. ramosa, so information on O. ramosa was used to answer some questions.